Copyright Annals of Surgery, 1931. In the early 20th century, transillumination — shining a light through the tissue of interest — was employed as a diagnostic aid for conditions such as inflammation of the sinuses. Max Cutler, attending radiation therapist at the New York City Cancer Institute, wondered if the technique might find application in the differential diagnosis of breast tumours. 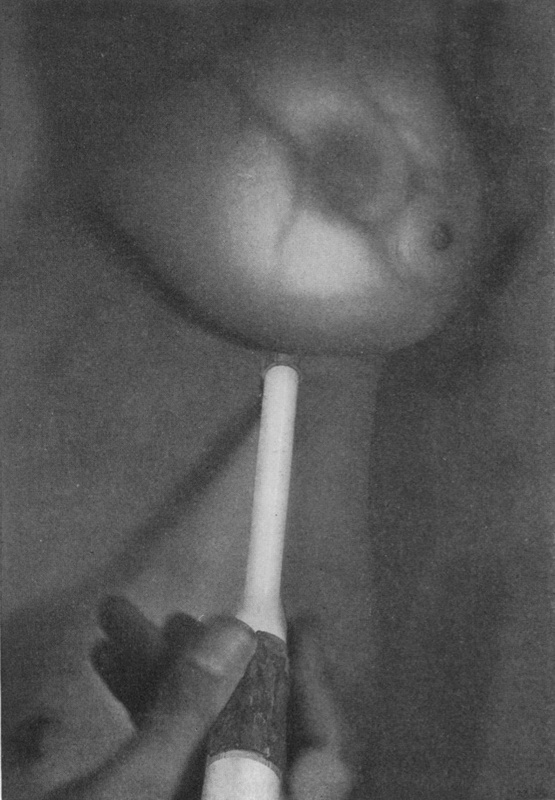 He studied 176 breast lesions and in 1931 published his landmark findings in the Annals of Surgery, illustrating both normal tissues and solid tumours (see image at left), and concluded that transillumination was a simple procedure that could be of value for interpreting pathological conditions of the mammary gland. It would be another thirty years before mammography — an X-ray of the breast — came into common use for the diagnosis of breast lesions. Transillumination of the breast, despite its safety (lack of ionizing radiation), ease of use and low cost, appeared to fall by the wayside. In the 1980s David Watmough, a medical physicist from Aberdeen in Scotland, invented a system that combined light with Doppler ultrasound for examining the female breast. The clinical results were published in the British Journal of Radiology but the system unfortunately had poor sensitivity when compared to mammography. More recently another group of enterprising Scots has brought out a consumer product called Breastlight™ that is being distributed via retail pharmacies throughout the UK and across Europe (see image below right). 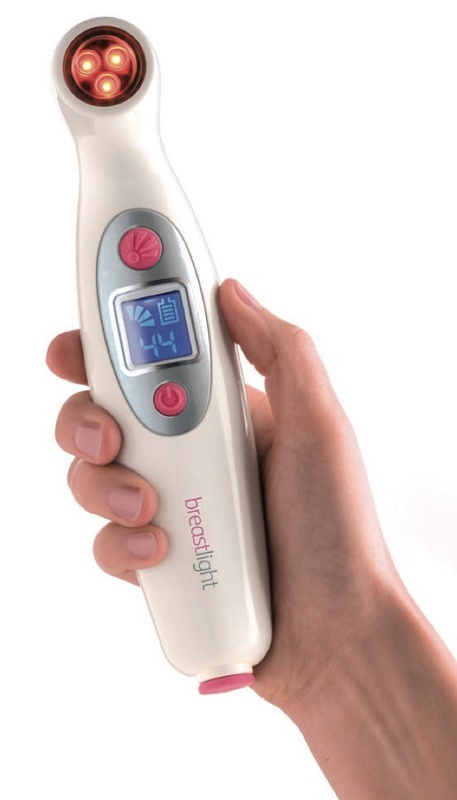 Breastlight costs just £130 and has been designed for women to use at home as part of their regular breast self-examination. The company’s product literature quotes Dr Sarah Burnett, a consulting radiologist and breast cancer survivor, who says: “Using Breastlight may increase confidence in women’s breast assessment and their ability to communicate with their own doctors.” To its credit, the company does not claim that Breastlight is a substitute for mammography, but rather that it promotes “enlightened” breast awareness. Emmanuel Elobu is a surgeon at the Mulago Hospital in Uganda who asked the question: Could breast transillumination (BT) be a viable alternative for screening in clinical settings with limited resources? He recruited 201 patients who underwent examination with both BT (using Breastlight) and mammography and recently published his results in Annals of African Surgery. Although BT had moderate sensitivity at 63% (compared to 74% for mammography), it had specificity of 90%, leading Elobu to conclude that although BT was not a substitute for mammography, it could be an option when resources were limited. There is another breast world of trans-illumination, thermography, magic bras and hocus-pocus that reside on the periphery of breast examination and investigation. The motivation in most is financial, and their scientific testing is zero. Their sensitivity and specificity don’t past medical muster. Their danger is false reassurance, and delay in diagnosis, and misdiagnosis. With something as serious as breast cancer, the need is for something as serious as mammography and ultrasound, and continuous improvement of these. Thanks for this feedback, David. There is some more sophisticated technology out there that combines photo-stimulation using an infrared laser with 3D ultrasound imaging that we are watching carefully. Ultimately, of course, all these new systems will have to be subjected to thorough clinical testing. In the end, it all comes down to having values for both sensitivity and specificity that approach 100%.